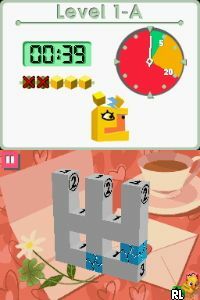 OverviewPicross 3D is a three-dimensional take on the classic game of Picross, challenging players with managing three axes rather than only two. 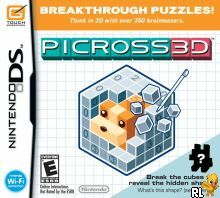 If you've never heard of the original Picross (or a Nonogram, Paint by Numbers, Gridder type puzzle), you might seem a little lost at first with this game. Thankfully, it has a nice tutorial to get you going. Basically, you're given a block separated into several squares with numbers on the sides. The numbers tell you how many blocks belong in that row/collumn, and you have to figure which ones to chissel out. This is made easier by letting you color the blocks that you know should stay. The game has what feels like a gigantic amount of puzzles; I've had this game since the day it came out and I'm still on Easy mode! Like the original Picross, this is a very good game to relax with, though it requires a lot of thinking and concentration to do well. You can download a ton of bonus content and make your own puzzles to share with friends. This is one my highest recommendations for the DS, and if you try it, it just might become one of yours too! I'd give this a 6/5 if I could. It's that good! 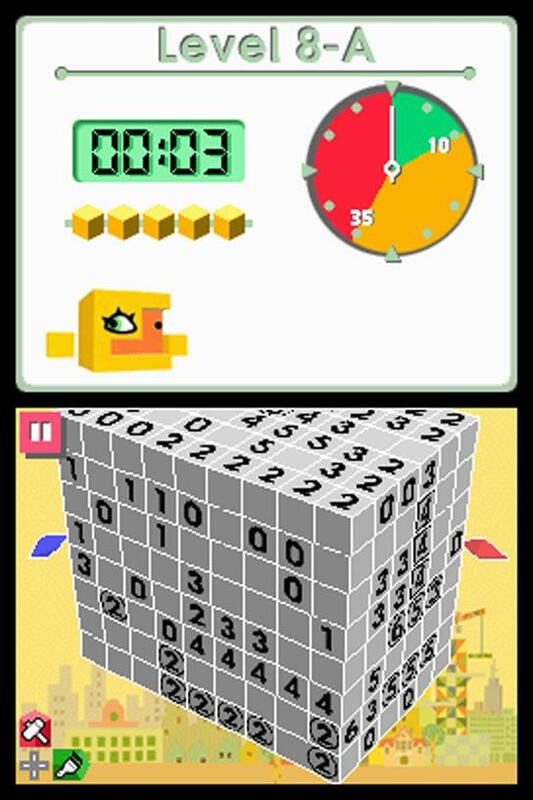 While Picross presents a rectangular grid of squares, which must be filled in to create a picture, Picross 3D uses a rectangular prism made of a number of smaller cubes, and must be chipped away in order to construct an image in three dimensions. Each row or column has at most one number corresponding to it, and many do not have any numbers at all; the number indicates how many cubes the row/column should contain when the picture is complete. If a number has a circle around it, it means that, while that number of cubes is the total amount in the row/column, they will be split up into two groups (for example, a 4 with a circle around it will be in two groups of either 1 and 3 or 2 and 2). If a number has a square around it, the cubes will be split up into three or more groups. If there are no numbers on a row or column, there are no rules concerning how many cubes belong there. A paintbrush may be used to mark cubes that definitely will remain in the image (which also prevents them from being broken accidentally), or a hammer to chip away at the unnecessary cubes. 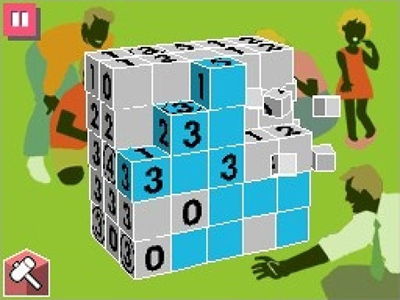 If an attempt is made to break a cube that is part of the image, the game will count this as a strike. If the player receives five strikes, the player is out and will have to start the puzzle over again. 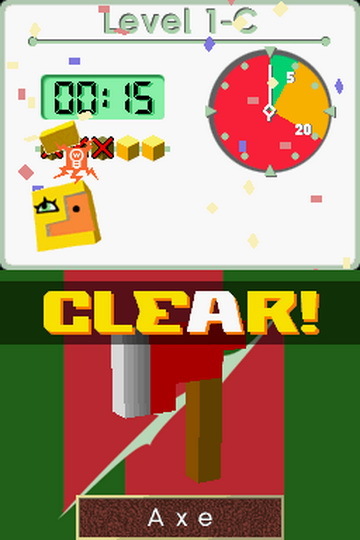 Players will also need to complete the stage within a certain amount of time. 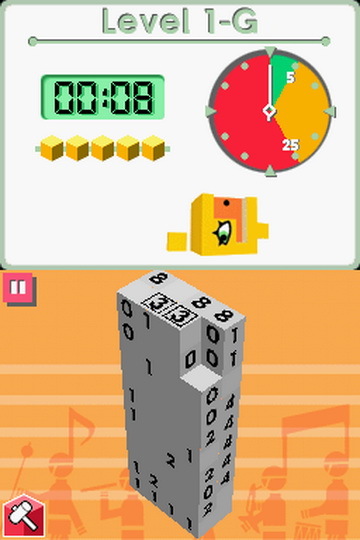 Early on, the game will show players "technique" tutorials to help them refine their puzzle-solving skills. Once a 3D image is completed, the player will be rewarded with a short animation regarding the image, and it will be placed into a themed collection, encouraging players to complete each collection. 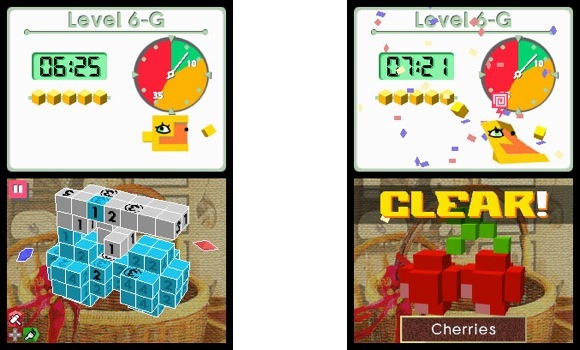 During standard puzzles, up to three stars are awarded based on the player's performance (completing the puzzle within a certain time limit and with no strikes earns maximum stars) which unlock additional bonus puzzles in each level. 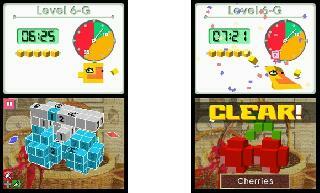 In between certain levels are "One Chance Challenges", where players make just ONE mistake and they're out, "Time Challenges", which require players to quickly chip away cubes to extend their time limit, and "Construction Challenges" in which multiple puzzles are completed to form one giant image. Bonus animations can also be unlocked under certain conditions, such as completing each difficulty setting. The collection content makes this game Edutainment, although it has slapstick in it. 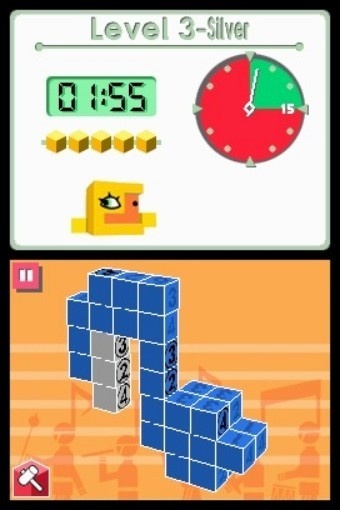 Outside of the main mode, players can also download additional puzzles via the Nintendo Wi-Fi Connection, as well as create their own puzzles, which can be shared with friends or entered into themed challenges. 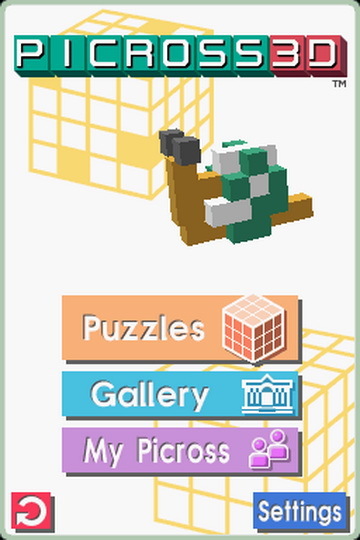 I dislike picross and sudoku, but picross 3d is awesome. 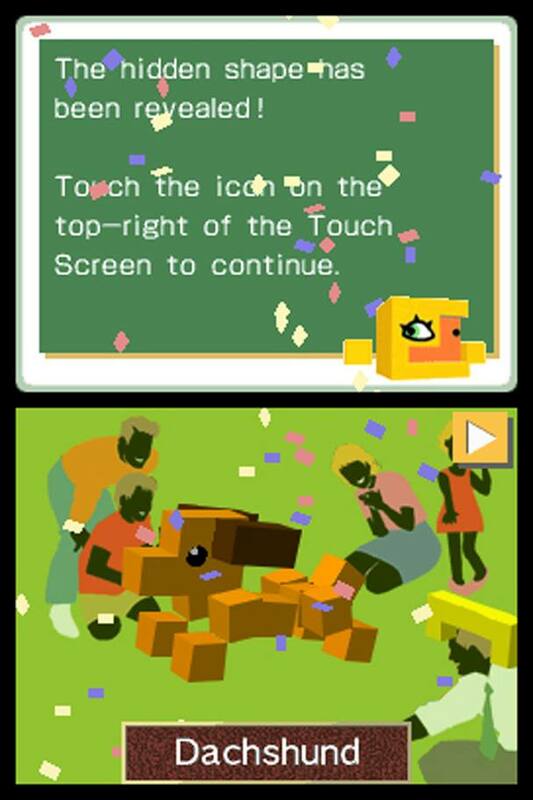 The animations at the end of each puzzle are very well-done, and in an adorable, minimalist sort of way. 300+ puzzles will keep you busy for a long time. Now you can add videos, screenshots, or other images (cover scans, disc scans, etc.) 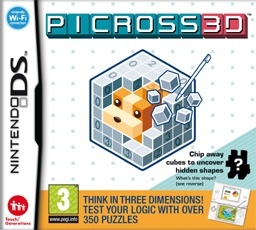 for Picross 3D (U) to Emuparadise. Do it now! If you haven't noticed yet, we have a retro game of the day feature (top-right of the screen) wherein we feature a new retro title every single day! Now, you can vote for your favorite games and allow them to have their moment of glory. 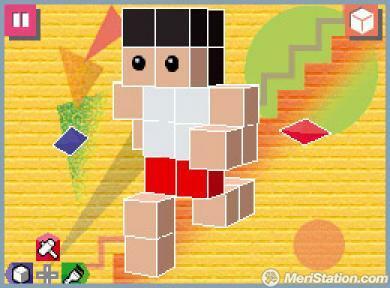 Click on the button below to nominate Picross 3D (U) for Retro Game of the Day.